I just had a look at Wikipedia's article on Treblinka. The believers seem to have taken firm control by now, and I was interested to note that it is now a petrol (gasoline) engine. So I thought I'd explore the article history. The victims were gassed with carbon monoxide generated by diesel engines. The victims were gassed with carbon monoxide generated by diesel engines. There is some historical debate over whether these engines were diesel or petrol. Upon arriving in Sobibor I discovered a piece of open ground close to the station on which there was a concrete building and several other permanent buildings. The Sonderkommando at Sobibor was led by Thomalla. Amongst the SS personnel there were Floss, Bauer, Stangl, Schwarz, Barbl and others. We unloaded the motor. It was a heavy, Russian petrol engine (presumably a tank or tractor engine) of at least 200 HP (carburettor engine, eight-cylinder, water-cooled). We put the engine on a concrete plinth and attached a pipe to the exhaust outlet. Then we tried out the engine. At first it did not work. I repaired the ignition and the valve and suddenly the engine started. The chemist whom I already knew from Belzec went into the gas chamber with a measuring device in order to measure the gas concentration. After this a test gassing was carried out. I seem to remember that thirty to forty women were gassed in a gas chamber. The Jewesses had to undress in a clearing in the wood which had been roofed over, near the gas chamber. They were herded into the gas chamber by the above-mentioned SS members and Ukrainian volunteers. When the women had been shut up in the gas chamber I attended to the engine together with Bauer. The engine immediately started ticking over. We both stood next to the engine and switched it up to "release exhaust to chamber" so that the gases were channelled into the chamber. On the instigation of the chemist I revved up the engine, which meant that no extra gas had to be added later. After about ten minutes the thirty to forty women were dead. The chemist and the SS gave the signal to turn off the engine. Subsequently I went to Treblinka. In this extermination camp I installed a generator which supplied electric light for the barracks. The work in Treblinka took me about three to four busy months. During my stay there transports of Jews who were gassed were coming in daily. He says nothing about the engine he installed at Treblinka or even whether that was the engine allegedly used for gassing. And apparently, at Sobibor, ten minutes was enough for certainty of a 100% death rate. The floors were covered with tin-plated sheet metal, the same material used for the roof. Solid wooden doors were insulated with swaths of rubber and bolted from the outside by heavy cross-bars. A bit pointless sealing the doors of course as the back pressure would inhibit the exhaust gas from entering. Of course there are no primary sources: Wiki doesn't allow them as that's classed as "research", but as long as somebody said it once somewhere any old hearsay will do. Historical revisionism has no place on Wikipedia. As poet T. Carmi said: "What happened, really happened." Well done, Kingfisher. In addition to the Wiki shysters we have this attempted switch from diesel to gasoline, they can't keep their stories straight. "Belzec, Sobibor and Treblinka were established as part of Aktion Reinhard (headed by Globocnik), the murder operation principally aimed at the Jews of the General Government in Poland, and used carbon monoxide gas generated by a diesel or gas engine. About 600,000 Jews were murdered at Belzec, whilst it operated between March and December 1942; between about 250,000 and 500,000 Jews were murdered at Sobibor during its operation between April 1942 and October 1943; and between about 870,000 and 1.1 million Jews were murdered at Treblinka between July 1942 and August 1943." The 'holocaust' storyline is one of the most easily debunked narratives ever contrived. That is why those who debunk it are arrested and persecuted. That is why violent racist Jewish supremacists demand that there be no open debate. Years ago, the Holocaust Controversies issued an article "Why the Diesel Issue is Irrelevant." It was discussed here in this thread. What is shown is that the switch to petrol is no better for the holocaust story. Now we are all aware of how exterminationists love to claim victory for fixing mistakes the revisionists pointed out first. Science already establishing the switch from petrol to diesel does not help one bit, I would be curious to know when this information about the switch to the petrol FIRST came about. Does anybody know? How many years away was it from Fritz Berg's early work in the 80's and/or 90's on the impossibilty of killing with diesel exhaust? I want to know when it first came out, "Oh wait a minute, people who spoke of a diesel were never in a position to see it, so let's re-examine testimonies and some documents to see who would have been in an actual position to see the engine, and focus on their words." Did exterminationists decide that all for themselves and revisionists went "ah-hah", or did revisionists first publish the science on the impossiblity of using diesel, WHICH THEN forced the exterminationists to go back and re-examine their usual sources? Does anybody know the order of how it went down? Werd wrote: Years ago, the Holocaust Controversies issued an article "Why the Diesel Issue is Irrelevant." It was discussed here in this thread. What is shown is that the switch to petrol is no better for the holocausy story. Unfortunately that's only true at one level. The level that matters is the level of impact on the general public. At that level the diesel story is easily demonstrated to be impossible, but the petrol story is plausible and plausibility is enough when the default setting is overwhelmingly acceptance. In a short time no one will even remember that they said diesel for sixty-five years, and even if they do, the position taken will be "We got that detail wrong for a while, but thanks to research we've been able to correct it". Simple logic: "It couldn't have been diesel: OK, so it must have been petrol." Case proved. A few years ago, there were revisionist voices getting heard on the Talk page for this article: I contributed myself. Now they appear to go unchallenged. (Note some of the revisionist contributions were too strident and easily dismissed as "neo-Nazis and anti-Semites". Kingfisher wrote: A few years ago, there were revisionist voices getting heard on the Talk page for this article: I contributed myself. Now they appear to go unchallenged. (Note some of the revisionist contributions were too strident and easily dismissed as "neo-Nazis and anti-Semites". Give me a break. As if the outrageous namecalling and impossible claims made by Jewish supremacists are not "strident". Your comment is simply bizarre, Kingfisher. I say get in their face and call them the liars that they are. We're winning this thing. Go and look for yourself, at the beginning of Archive 1. That's precisely how they were dismissed. It's not a debate in front of a neutral audience. Just about everyone is on "the other side". If they can brand you as "neo-Nazi and anti-Semite" it doesn't matter what the reality is. They have won by name-calling. PS. Take your break any time you like. Can somebody tell jewishvirtuallibrary.org and holocaust-history.com about this new Holohoax update (because they still say that the Reinhardt camps killed with Diesel engines from captured Soviet T-34 tanks)? According to Martin Gilbert in his book, Holocaust Journey, the gas chambers at Treblinka utilized carbon monoxide from diesel engines. Many writers say that these diesel engines were obtained from captured Russian submarines, but according to the Nizkor Project, they were large 500 BHP engines from captured Soviet T-34 tanks. At the Nuremberg trial of the Nazi war criminals, the American government charged that the Jews were murdered at Treblinka in "steam chambers," not gas chambers. The Aktion Reinhard camps were primitive, but efficient, venues for conducting genocide. Belzec was built first under the inspectorate of Christian Wirth, a crude, barbaric and cruel overseer. It was the proving ground for the other camps. The methods needed to control, murder and dispose of the bodies of thousands of people a day were developed and tested there. 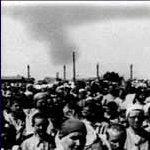 Sobibor was a refinement of Belzec. Treblinka, under Franz Stangl, developed and perfected an efficient conveyor belt for importing and transforming innocent people into ashes. Stangl was the most competent of the camp commanders. Under him, roads were paved, flower beds planted, a zoo built, and 850,000 people were exterminated. Death came through asphyxiation from the exhaust of a large internal combustion engine - reportedly a captured Soviet T-34 diesel engine (Figure 12). Last edited by hermod on Wed Apr 30, 2014 7:18 am, edited 2 times in total. Can somebody tell jewishvirtuallibrary.org and holocaust-history.com about this new Holohoax update because they still say that the Reinhardt camps killed with Diesel engines from captured Soviet T-34 tanks? They've got no evidence at all. Whatever they have, from Erich Fuchs, relates to Sobibor. They just transposed it. The coterie that have cornered Wikipedia on H-related topics can just say whatever they like. Normal Wikipedia standards and challenges don't apply because only Holocaust Deniers deny the Holocaust. However, if challenges are to be made, they will have to be in the tone and language appropriate to an encylopaedia, and they will have to go through Wikipedia procedures: something which I am not familiar with. While Revisionists can never win on the main issue, it is possible to get a greater degree of uncertainty, reflecting the reality, into those pages. This has been managed with the Holocaust Denial page https://en.wikipedia.org/wiki/Holocaust_Denial which is at least fair in parts. According to my limited and recent researches on Wikipedia, the Soviet Union started the war with a substantial number of petrol-driven tanks, but the T-34 was diesel. I recall reading somewhere that the Germans deployed some captured Soviet tanks. It may have been in Suvorov. As DenierBud has pointed out, though, the idea that they shipped a submarine engine all the way up the Bug to Treblinka is ludicrous, even if they had captured one, which they didn't. It's a measure of how the Holocaust consists of stuff being repeated without any thought of whether it might not actually be true. Yes, they certainly rely on name calling, but that tactic is losing it's punch. The obvious racism of Israel, who labels anyone an 'antisemite' or 'neo-nazi' for criticizing Israel's violent apartheid policies has actually watered down the effectiveness of such tactics. It's also described as 'crying wolf'. IOW, the credibility of name calling as an aid to the Zionist agenda is being diminished more & more everyday. All of this assists in bringing people into the Revisionist school. The hoax is metamorphosing to no avail. Gasoline exhaust with its high CO content would lead to countless bright cherry red corpses at the moment of death and for days thereafter--especially visible on those alleged huge piles of naked corpses. There are, however, NO eyewitness claims at all for any of the AR camps that speak of such coloring and only one such claim for Auschwitz-Birkenau (Henryk Tauber). There should have been many such eyewitnesses. Any real eyewitnesses would have seen it. Instead, almost every color other than red, even "green," is given by self-described "eyewitnesses." Friedrich Paul Berg wrote: The hoax is metamorphosing to no avail. Gasoline exhaust with its high CO content would lead to countless bright cherry red corpses at the moment of death and for days thereafter--especially visible on those alleged huge piles of naked corpses. That's very true, Mr Berg. Franz Stangl shouldn't have said "I think it started the day I first saw the Totenlager [extermination area] in Treblinka. I remember Wirth standing there, next to the pits full of black-blue corpses." as he did. What? The Police Superintendent of the Hartheim and Bernburg Euthanasia centres and Commandant of the Treblinka and Sobibor "Death camps" didn't even know how a CO poisoning looks like? When CO is not ventilated it binds to hemoglobin, which is the principal oxygen-carrying compound in blood; this produces a compound known as carboxyhemoglobin. 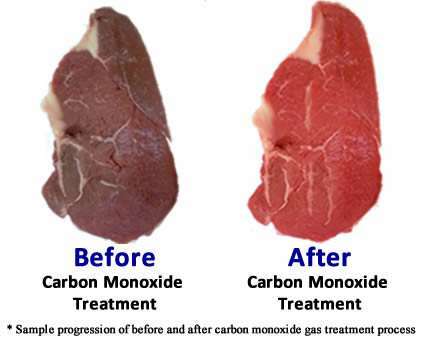 [...] Hemoglobin acquires a bright red color when converted into carboxyhemoglobin, so poisoned cadavers and even commercial meats treated with carbon monoxide acquire an unnatural reddish hue.